Can you bag a Munro and raise funds for cancer research at the University of Glasgow? Then you can take part in the Munro Challenge! The aim of the event is to have groups of walkers on top of as many of Scotland's 282 Munros as possible, throughout the weekend of 25th-27th May 2019. 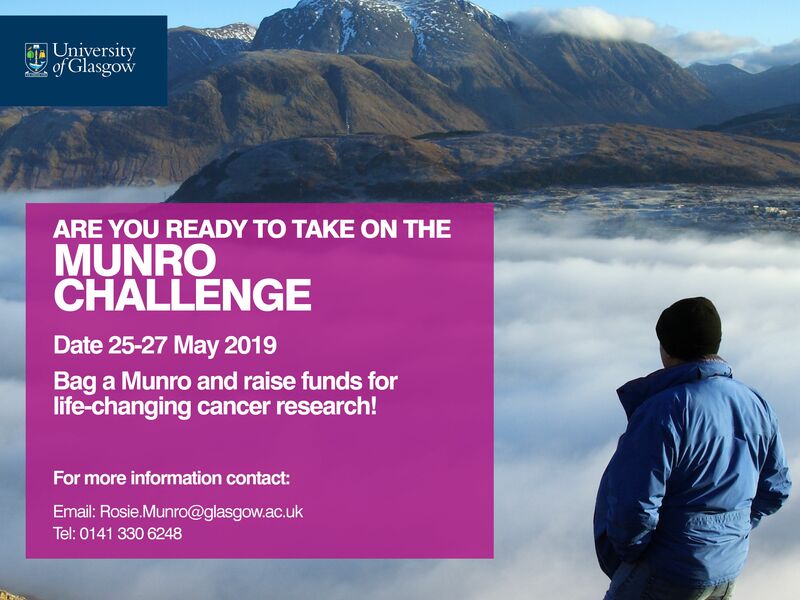 The Munro Challenge is fundraising for cancer research at the University. Participants can choose to fundraise for The Beatson Pebble Appeal, including Prostate and Pancreatic Cancer research, The Paul O'Gorman Leukaemia Research Centre, Think Pink Scotland or the Brain Tumour Research Fund. Participation should be in teams of between 2 and 8 persons, with at least one person in each team being an experienced walker. All participants will be asked to sign a disclaimer and be provided with safety guidelines. Registration is free. Participants are asked to try and raise at least £50.00 in sponsorship for their chosen appeal. As an added incentive, there will be a prize for the best photograph at the top! The Munro Challenge is open to the wider public and not just University of Glasgow staff and students.